Dubai is one of the largest centers for gold shopping. People around the world travel to Dubai in the month of January andFebruary just to be the part of the "Dubai Shopping Festival" and especially to purchasethe gold items, which are available at cheaper rates. Dubai being a duty free destination, saves a lot of money for shoppers. The gold market is very famous there which is also known as the Dubai Gold Souk. All types of gold ornaments are found there even you can easily find the rare rose gold jewellery for his loved ones. Nowadays, not only women but also men have aneye for this precious metal. They also love to wear designer accessories, like heavy neck chains or a chained bracelet, ear studs etc. As speaking of this precious metal gold, it is too soft in origin that it difficult to convert it into a solid design. So, other alloys are used to give it a perfection as a jewelry, while the addition is employed different colors are used to give it anew and unique look. These new looks we can trace in the shops around the city in gold colored as black , yellow the original color , pink, green colors can be added according to choice. A new and unique design, one finds in the Dubai.The city can be termed as desirable, economical and one place to finds the rarest quality of gold ornaments without searching here and there. In the market, you will nearly two hundred and fifty shops to glitter your eyes with their unique and creative designs. Take your time when in Dubai to shop for gold. Every day you would find new designs and new prices in every shop. 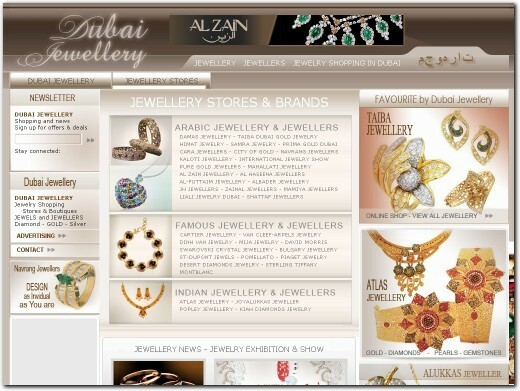 UAE (Dubai) based company offering information on shopping for jewellery in Dubai. Website features details on various jewellery outlets in the city, as well as the malls you can visit too.